A man has been arrested for getting on a horse while drunk and nearly making it to the track at the Breeders' Cup meet in Kentucky, local media report. Michael Wells-Rody, 24, sneaked into "a restricted area", grabbed a horse and was "in the track entrance" before being stopped, says a police report. It added he was "under the influence of alcoholic beverages" and was "loud and disorderly" when asked to dismount. 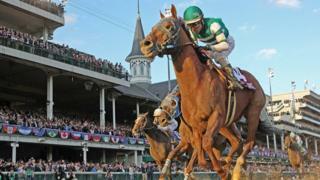 The $6m Breeders' Cup Classic was won by Accelerate at Churchill Downs. Enable, ridden by Frankie Dettori, won the Breeders' Cup Turf race to become the first horse to win both a Breeders' Cup fixture and the Prix de l'Arc de Triomphe. The Breeders' Cup is one of the biggest meetings on the American racing calendar. According to the report in the Lexington Herald Leader, Wells-Rody has been charged with alcohol intoxication in a public place and disorderly conduct, and is scheduled to appear in court on Monday.